This is Quincy Adeboyejo’s time to shine. In 2013, the 6-foot-3 wide receiver, a native of Texas, arrived in Oxford along with another great receiver, Laquon Treadwell, as a part of Ole Miss’ heralded recruiting class. Treadwell and another standout receiver from last year, Cody Core, are now playing on Sundays, and Adeboyejo is the player many expect will fill the void left by their departure. The Rebel Walk recently interviewed Quincy and asked what he will remember most about his time at Ole Miss. “I think what I’ll remember most is just my first week being here, just getting used to being here and being away from my family,” he began. “I’ve come a long way,” he said, explaining that he used to go back home to Cedar Hill whenever he had any break. But as is the case with many young men who begin their careers at Ole Miss, it soon becomes home. “I just really fell in love with the place,” Quincy said, noting that he doesn’t go home nearly as frequently as he used to. I just really fell in love with the place. 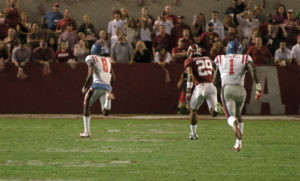 Many Ole Miss football fans can probably name Quincy’s choice for his most memorable gridiron moment, at least thus far in his career. If you guessed the 2015 Alabama game, you’re absolutely correct. In last year’s matchup in Tuscaloosa, Quincy caught a Chad Kelly pass intended for Treadwell—the pass deflected off the helmet of one of the Tide players and landed in Adeboyejo’s hands. Adeboyejo, who runs a 4.41 40, not only was alert enough to catch the ball as it caromed off a helmet, but he ran 66 yards for a touchdown in the Rebels’ 43-37 win over Alabama. It was one of ESPN’s top plays of the year, with good reason. This season Quincy is surrounded by what many consider to be the best receiving corps in the nation: Damore’ea Stringfellow, Markell Pack, Van Jefferson, DaMarkus Lodge, and Derrick Jones all return, joined by star newcomers A.J. Brown, Tre Nixon and D.K. Metcalf. Quincy and the other receivers know they are among the top in the nation at their position. There’s like a handful of guys here that would probably play anywhere in the country. We all like to push each other because we want to make that room the best in the country. We pride ourselves on being ‘Wide Receiver U.’ I think just having those guys and having everybody in there pushing each other is just going to bring the best out in every last one of us. Ole Miss wide receiver coach Grant Heard, who refers to Quincy as the “old man” of his group, commented recently on how much Quincy helps the new receivers, so we asked Quincy how he is making the transition to college ball easier for the incoming recruits. I try to help them out with the mental part a lot because I know how stressed out I was coming in as a freshman trying to learn the plays and trying to put everything together. It just kind of happens so fast. You get one little summer session to try and learn the play book, and once camp starts it’s rolling and you can get left behind—or you can stay on track. While Quincy is focused on his own play, he’s also doing what he can to help his teammates. “I’ve been trying to give them things that will help them get the playbook down easier and faster, things that I wish I could have done so I try to share that with them so they can do those things that will help them when camp comes,” he explained. It seems one cannot play for Ole Miss or live in Oxford without becoming extremely attached. We asked Quincy why Ole Miss is so special to him. With so many highly-ranked receivers committing to Ole Miss, we asked Quincy if he can put his finger on why they are choosing the Rebels. First of all, Coach Freeze just recruits really well. And also having the opportunity to play for something that’s above yourself, like playing for something like ‘Wide Receiver U.’ We are not only playing for the team, but we’re also playing for each other as a group. It’s just the bond that we’ve created and guys just want to be a part of that. The Rebel Walk asked Quincy if there is a player after whom he patterns himself or one who has been a role model to him as a receiver. His answer is no surprise. “Who influenced me the most is Donte (Moncrief),” he explained. We were curious which defender Quincy believes is the toughest he has faced, and his answer might be surprising to some. 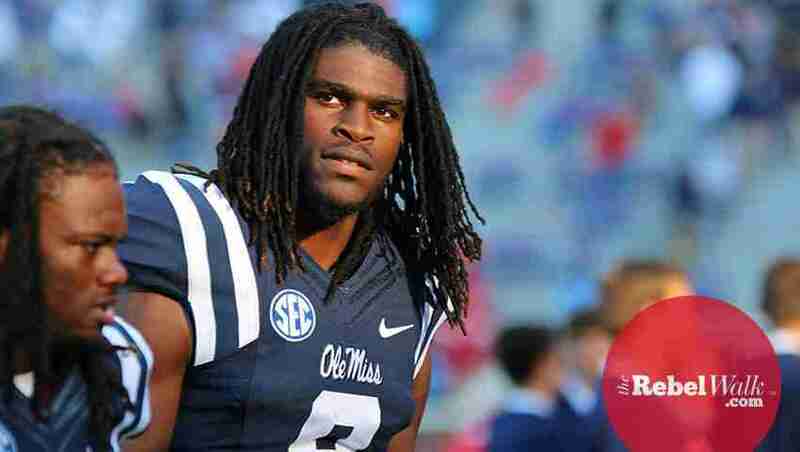 “I would say (Ole Miss junior) Ken Webster. He’s one of our own guys. He’s probably one of the better corners I’ve played against in my career here, high school, all that stuff. He’s just really technically sound. He knows what he’s doing and he knows how to read receivers. We asked Quincy if there was any particular area in which he wanted to see improvement in his game. His answer is exactly what one would expect from a hard-working, senior leader. From his sophomore to junior year, Quincy doubled his receiving yards. Now, entering his senior season, we asked him if he sees himself doubling last year’s numbers. “You never know, but that’s the goal,” he said, smiling.